You might have heard the Texas Rangers are selling a 24-inch-long hot dog called the Boomstick. “Where’s the big one?” I asked Arlington concession stand workers the other night, holding my hands apart about two feet. They pointed me down the first-base line. There, sizzling on a flat top, I saw Boomsticks, looking as plump as their namesake, Nelson Cruz. The Boomstick is served in a cardboard carrying case with two handles. The case looks like one a photographer uses to carry a tripod, or — maybe a better metaphor — an assassin uses to hide his rifle. The Boomstick is nearly impossible to pick up with tongs. You could watch concessions stand workers do this for nine innings and never get bored. You do not eat the Boomstick plain. You eat it with sautéed onions, chili, cheese. The price is $26. The Rangers sold 191 of them on Opening Day. Not so long ago, ballparks were bragging about healthful food. The Mariners served sushi, the Mets served Danny Meyer! But if I can overgeneralize from one Boomstick, I think we’ve pivoted, at least in Texas, toward a large-food arms race. Snacks are big and awesome and horrible on purpose. The ballpark has become the state fair. 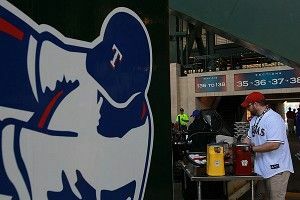 Indeed, with the Boomstick, the Rangers are stealing from the State Fair of Texas playbook. If you’ve never been to the State Fair of Texas, I can guarantee you’ve been offended by it. Each year, its new foods are announced to a horrified nation. Last year’s fair included deep-fried Texas salsa, fried bubble gum, and the so-called walking taco: beef, jalapeños, and other condiments stuffed into a Doritos bag. The fair before that offered up the deep-fried frozen margarita. As a native, I can tell you these foods represent a highly calculated yokeldom, an out-and-proud Texanness — Robert Earl Keen meets Kobayashi. Now, I went to find the Boomstick because I was going to eat one. But I couldn’t do it. My problem with the Boomstick wasn’t health, but awkwardness. Presuming you can’t kill an entire Boomstick yourself, you have to pass the cardboard carrying case back and forth with your pal. This violates all sorts of ballpark (and Ballpark) etiquette. A man standing next to me looked skeptically at the giant hot dog. Then he turned to his friend and said, “Ah want mah own.” I think he spoke for most all of us.